I'm so happy that you've found you're way here. Last month, I came across a fabulous pattern for a flying geese keychain and just had to make one. After making it, I couldn't wait to share it with you. Hello! Welcome to Sew Much Like Mom! I'm honored to have you here. I love hexagons, or as some fondly call them, "hexies". I love them pieced by hand. I love the big. I love them small. I love them in all sorts of colors and prints. Welcome to my little stop on the blog hop to celebrate Carrie Bloomston's new line of fabric: Story. If this is your first time visiting me, welcome! I'm Cristy Fincher. I'm a mom, wife, quilter, teacher, and pattern designer. I had the honor of meeting Carrie through our beautiful friend, Bari J. 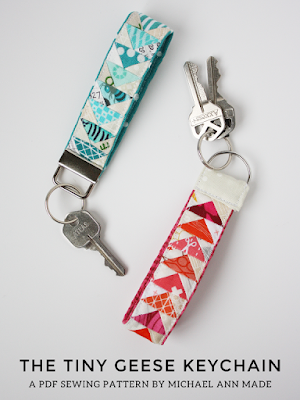 My New Craftsy Class and a Giveaway! The past couple of months have been full of highs and lows. As most of you know, my mom's best friend and soul partner, Tom Russell, passed away unexpectedly in January. I'm still at a loss for words to express how I feel about his passing, and how to express my love for him. Gosh, it's been such a long time. I'm sorry for being absent for so long. I think I need more hours in my day so I can write more blog posts and tutorials, and record more podcasts for you. My second podcast episode is posted and ready for you to take a listen!